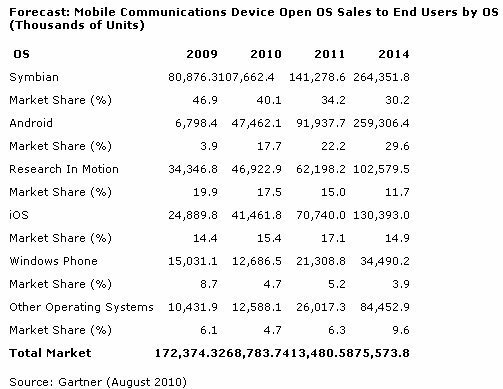 The worldwide mobile operating system market will be dominated by Symbian and Android, as the two OSs will account for 59.8 percent of mobile OS sales by 2014, according to Gartner. The research firm predicts that Symbian will remain at the top of Gartner’s worldwide OS ranking due to Nokia‘s volume and the push into more mass market price points. However, by the end of the forecast period, the No. 1 spot will be contested with Android, which will be at a very similar share level. 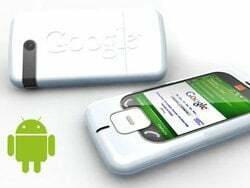 According to Gartner, communication service providers’ marketing and vendor support for Android-based smartphones will drive the platform to become the second-largest platform, following Symbian, by year-end 2010. This is almost two years earlier than Gartner predicted a year ago. "The worldwide mobile OS market is dominated by four players: Symbian, Android, Research In Motion and iOS," said Roberta Cozza, principal research analyst at Gartner. "Launches of updated operating systems — such as Apple iOS 4, BlackBerry OS 6, Symbian 3 and Symbian 4, and Windows Phone 7 — will help maintain strong growth in smartphones in 2H10 and 2011 and spur innovation. However, we believe that market share in the OS space will consolidate around a few key OS providers that have the most support from CSPs and developers and strong brand awareness with consumer and enterprise customers," she said. Gartner expects manufacturers such as Samsung to launch many new budget Android devices in 2H10 that will drive Android into mass market segments. Other players, such as Sony Ericsson, LG and Motorola, will follow a similar strategy. This trend should help Android become the top OS in North America by the end of 2010. "CSPs and mobile device manufacturers alike will need to revisit their platform strategies and balance the need to pursue platforms with the highest current demand against the need to maintain differentiation with unique devices," Cozza said. "CSPs will likely reduce the number of platforms they offer, to reduce their support costs and clarify their propositions to market." Gartner predicts that by 2014, open-source platforms will continue to dominate more than 60 percent of the market for smartphones. Single-source platforms, such as Apple’s iOS and Research In Motion’s OS, will increase in unit terms, but their growth rate will be below market average and not enough to sustain share increase. Windows Phone will be relegated to sixth place behind MeeGo in Gartner’s worldwide OS ranking by 2014.